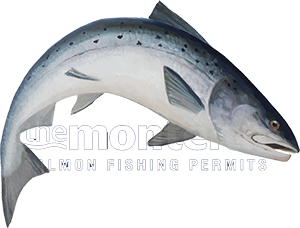 There's been literally millions of words written on this fascinating subject over the decades by many serious salmon fishers who all have their own take on what the best fly patterns are. At the end of the day it boils down to faith as we will never truly get inside a salmon's mind. Let me elaborate on the types of fly attributes and swim behaviours that build faith. Let's start with the word 'waggle' as there's not a lot that beats the 'swiggle & swaggle' from the tail of a salmon fly as it sweeps and darts through a pool. Selecting or tying a salmon fly that's got a tapered wing will give you this effect. Darting your salmon fly should also be something you need to think about and forget the consistently boring lifeless sweeps from the majority of angler's flies. Creating a darting action periodically with a inconsistently timed flick of the rod tip will also separate your fly from the pack. If you were a salmon lying 'doggo' at the bottom of a pool are you going to react or investigate a consistently boring fly swing through the pool or are you more likely to come and have a nip at the fly that's behaving differently in the stream. Common sense really once you switch your mind into 'sub surface fly mentality' mode and break from the 'launch and hope' pack. Become the fly and focus your thoughts on how it's performing at all times. This leads me to the next point. Bin any flies you may have that you've no faith in. In the old days my late mentor Willie 'the ghillie' Laird used to carry an old tobacco tin in his tweed jacket breast pocket. In this tin was about half a dozen flies in 2 or 3 sizes from tubes down to Summer sizes that looked battered and burst but they were effective year in year out. These were the trusted patterns Willie had faith in and he stuck with them with great success. On a personal note I like a bit of sparkle in the wing of the fly but only a few strands as it's so easy to over do the 'bling' which kills the overall appearance of the salmon fly. Two long stands of a holographic type of material will truly light up the wing if there's any presence of natural sunlight. Going also for softer fly material like Arctic Fox and Schlappen hackles will give your salmon fly more natural movement than the stiffer buck tail and regular hackle materials. Once you've got the attention of a few of the older salmon in a pool that other fly fishers haven't been able to catch then that's the proof you need that you've got a fly that will not just catch the 'easy fish' but will trick the older residents that have seen it all before. Look after that fly and be sure to shake the water off it when you put it to bed and give the hook point the occasional tickle with a hook point sharpener.